A significant event in the life of the Catholic dioceses of Cork & Ross and Cloyne took place on Tuesday 22nd January 2019. 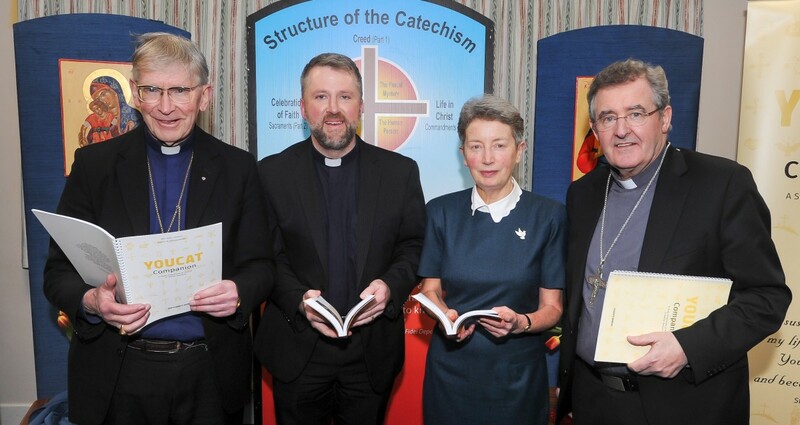 Hosted by the SMA Wilton Parish, it was the launch of a new faith formation initiative co-authored by Fr Seán Corkery and Máirín Ní Shúlleabháin entitled YOUCAT Companion. The event attracted a large gathering from throughout Ireland, and was attended by Bishop John Buckley and Bishop William Crean, both of whom led prayers for the occasion. The bishops underlined the need for all believers to share the Good News of Jesus Christ in a time when people are often confused or uncertain about what the Catholic Church teaches and why. YOUCAT is short for Youth Catechism. It is designed by young people for young people to give contemporary expression to the truths of the Catholic faith. Fr Seán and Máirín have devised a user-friendly study programme to accompany YOUCAT which families, schools and parishes can use to establish small study groups. YOUCAT Companion guides participants through the contents of the Catholic faith in an engaging and positive process of dialogue and sharing. Learning in small groups in this way is ideal for those seeking a sure reference point for life’s journey. YOUCAT Companion is divided into 20 sessions which Fr Seán and Máirín suggest would work well over the course of the school year (10 in Autumn and 10 in Spring). Participants focus on the four pillars of the Catholic faith, namely the Creed, the sacraments, the commandments, and The Lord’s Prayer. It took three years to develop YOUCAT Companion. It is the result of a rigorous theological and editing process of over 3000 hours. It was piloted in Cork, Westport, Dublin and Derry with a cross-section of people including third-level students, young parents, Pope John Paul II Award students and daily Mass goers. Therefore, while YOUCAT is primarily designed for 16-35 years olds, its value reaches far beyond this, making YOUCAT Companion the ideal resource for grown-ups of all ages that wish to explore their faith. A YOUCAT Companion study group will run for the six Wednesday nights of Lent, beginning on 6th March in SMA Parish Centre, Wilton, Cork City. If you want to hear more about what is involved or are interested in starting a group in your area, call Máirín on 087 7950325 or Fr Seán on 086 2420240.